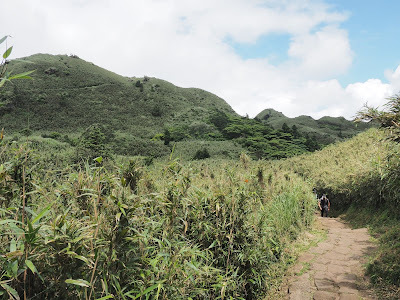 Yangmingshan National Park (陽明山國家公園) is located just next to Metropolitan Taipei and can be called a back garden of the city. 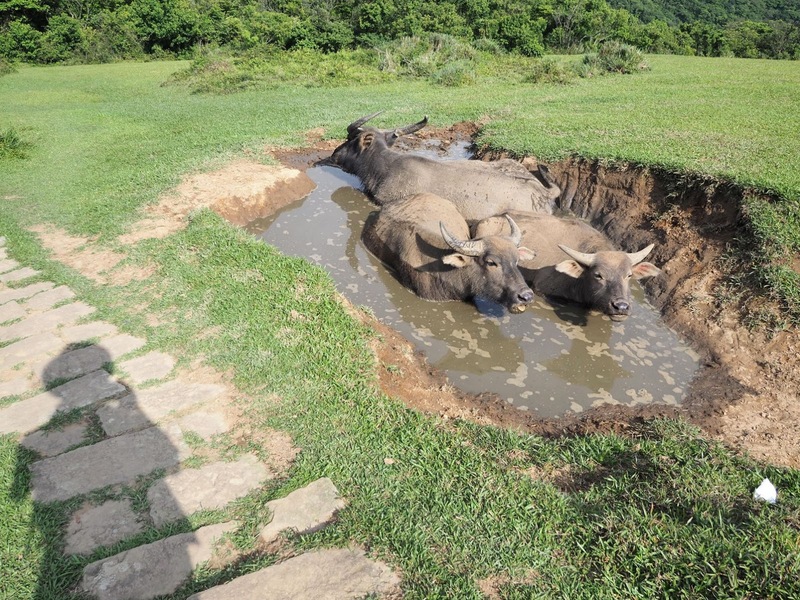 It is therefore a matter of course that citizens go there hiking and seek refreshment and beauty of mountain nature. The national park and Taipei municipal government maintain good trails over the range. 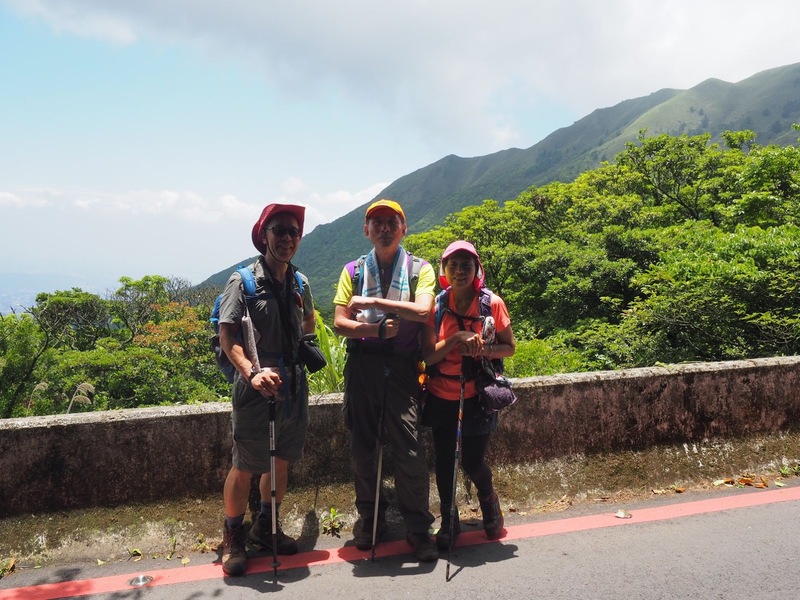 The access to trail heads are also very easy as there is an extensive network of MRT and bus services except very remote corners. You run into not a small number of overseas hikers there when you walk on the popular routes. 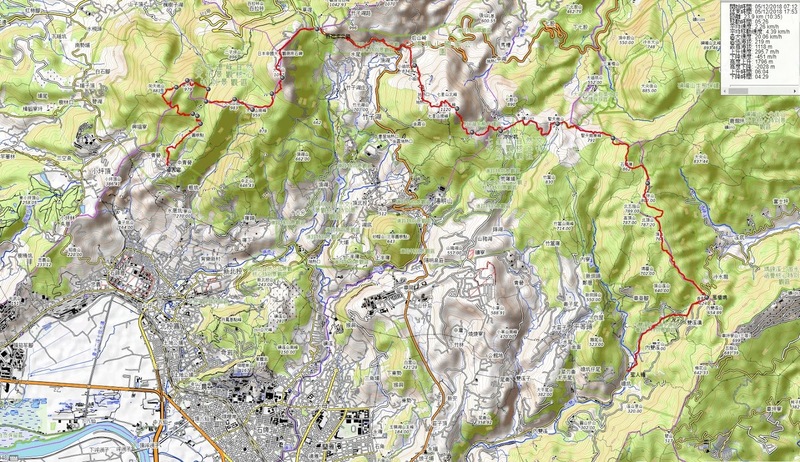 The hiking routes in the area are extensive. They cover almost all main peaks in the park except where the access is restricted due to military purpose like Mt. Zhuzishan (竹子山). For the past one or two years it has been a kind of fashion among keen hikers to walk across the whole range between Mt. 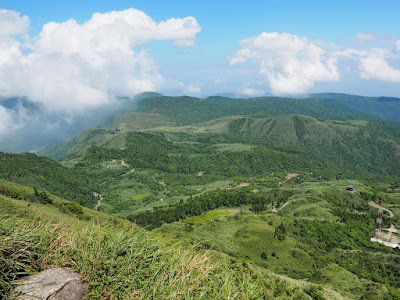 Miangtianshan (面天山) on the west and Fenguizui (風櫃嘴) pass on the east, which covers approximately 21 kilometers and takes about 10 hour or so to complete. Since many hikers take this route and leave message about their activities on SNS like Facebook, you can compare your hiking time with these and can find how fast or slow you are. I myself have been to Yanngminshan park many times in the past few years. There are few places left in the park where I have never been regardless of official trails or trails opened by volunteer hikers alike. 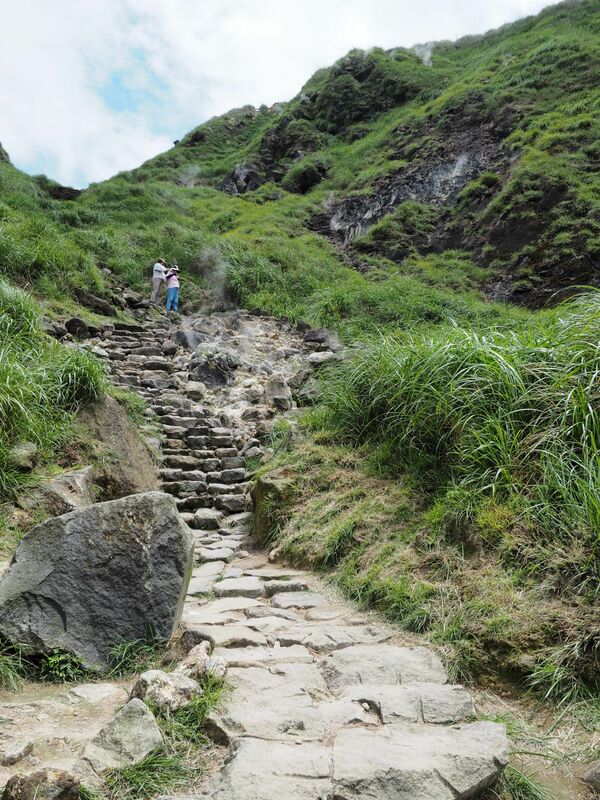 I like to explore new places so I have seldom visited Yanmingshan lately. 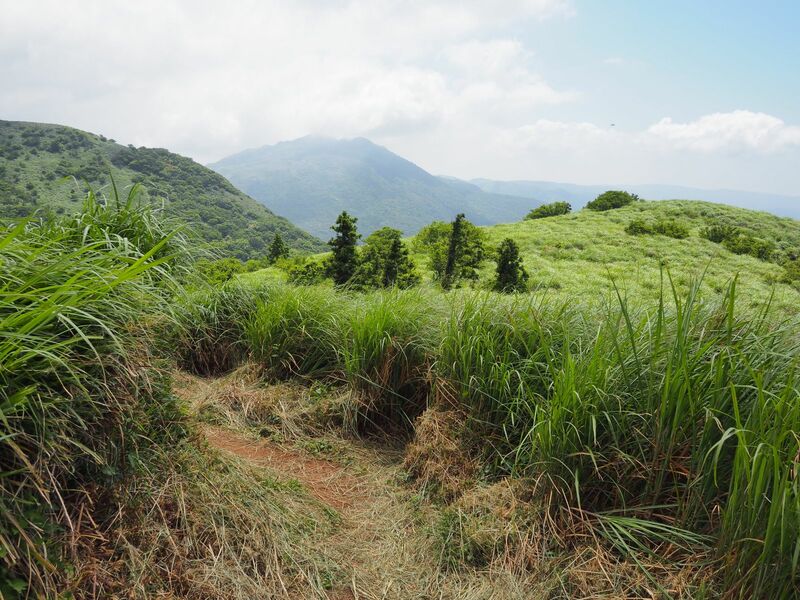 I have been to the places and routes that the east-west cross Yanmingshan haking covers but not walked the whole range through for one time. This is my motivation behind to walk the cross range route this time. I placed this schedule of hiking on my Fasebook page for any company, but it turned out that nobody was interested. In order to start as early as possible, I came to MRT Beitou (北投) station at 6:30. There is already a queue for a S6 (小6) bus. The bus comes at 6:47 and all seats of the small bus are soon filled up. The bus goes through streets of Beitou and climbs for Qingtiangong bus terminus. The bus arrives at 7:09 Qintiangong temple (清天宮) and all passengers including other hikers alight. It has already been a few years since I last came to this place. The sky is blue and it is not yet hot, very suitable for hiking. I start following the stone paved trail at 7:20. The trail goes along vegetable gardens and you can have a good view over the open gardens. 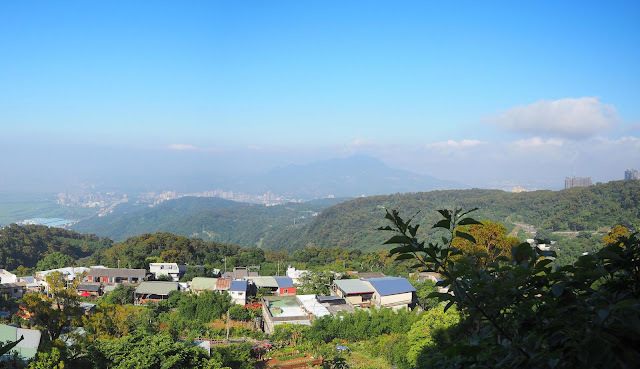 Tamsui river (淡水河) flows down below and Mt. Guanyinshan (觀音山) stands beyond. A few tall condominium buildings stand on the ridge coming down from Mt. Miantianshan, which I remember were under construction when I first hiked on this trail several years ago. The trail goes up and the gradient increases. I pass a couple of aged hikers around 0.4K kilopost. It goes under bamboo woods and dried leaves are on the step stones. At 7:42 I pass by the gate of Sanshenggong (三聖宮) temple. In another few minutes a junction shows up in front. I take left and head for Miantian pond (面天池). 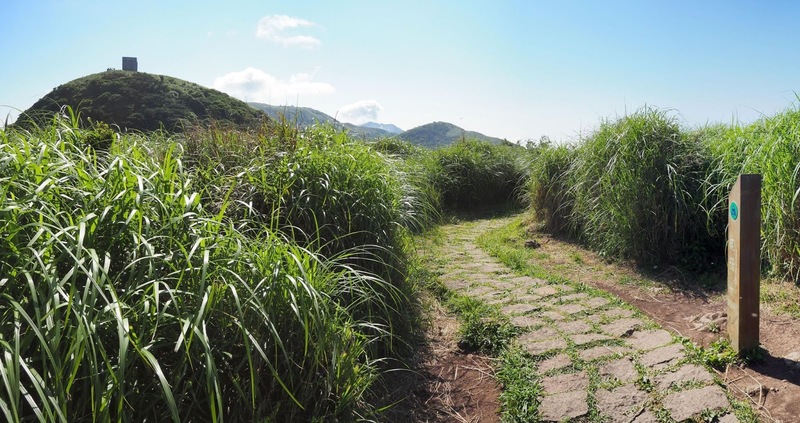 The right trail leads directly to Miantianping (面天坪), where I will pass by after coming down from Mt. Miantianshan. 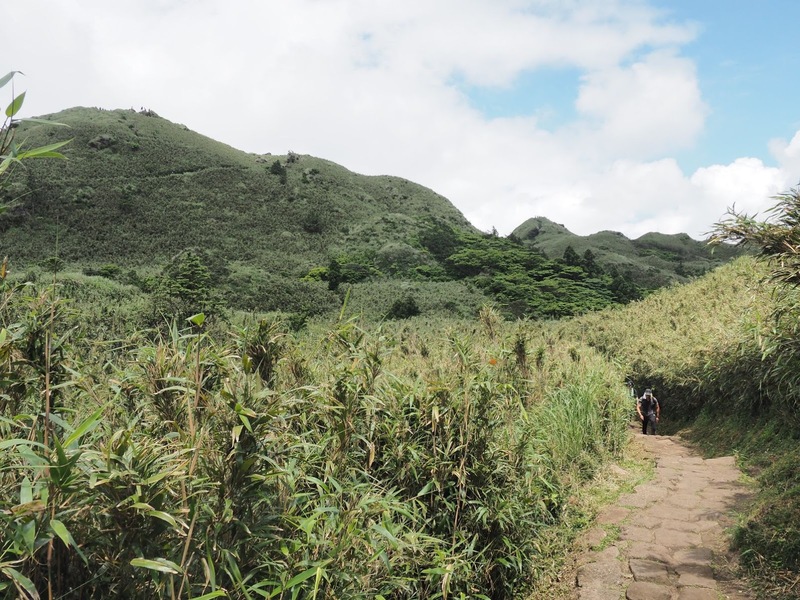 The trail to Miantian pond traverses the side of the mountain. 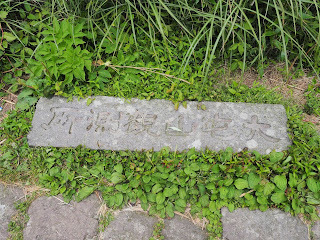 In a few minutes I come across a big stone monument, which was elected during the Japanese era to commemorate the visit of his highness, the crown prince of the time, later Showa emperor Hirohito. 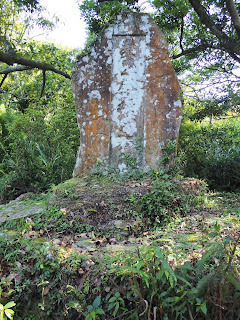 The prince did not come to this location after all but the stone monument remains. 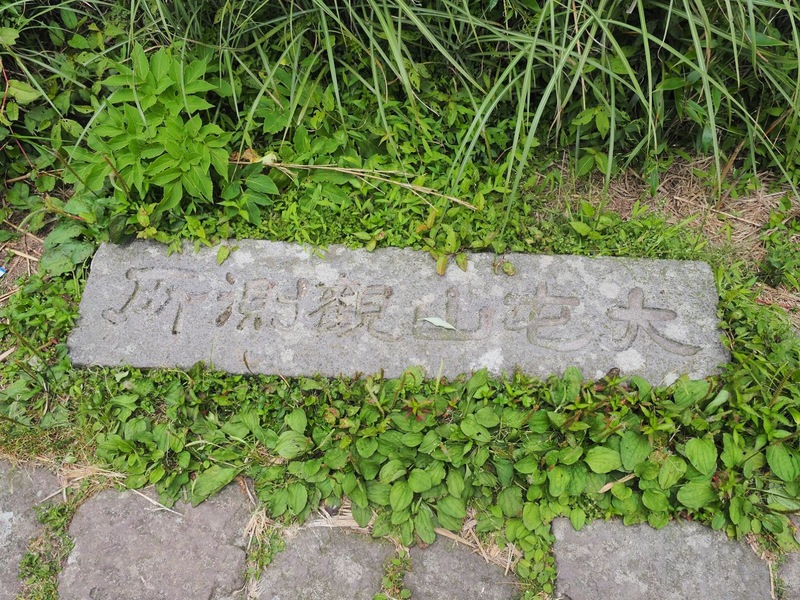 The inscriptions on both sides of the stone were erased by the Guomintang government (國民黨政府) after the war and unfortunately now unreadable. The trail soon comes to another junction which also leads to Minatinanping. I take left and keep on the trail to the pond. The trail goes up and down a few times and gradually gains height. At 8:13 I see the pond, which retains no water at this time. I follow the trail around the pond and comes to another junction. I take right and go up zigzag to Mt. Xiangtianshan (向天山). As I go up the voices of hikers coming from the place near the junction fades away. At 8:28 I come out of woods and go into an open area just covered by tall grasses. 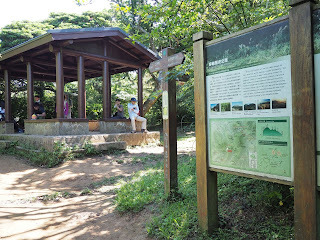 The sign of Mt. Xiangtianshan stands by the trail and the rectangle antenna stands atop the Mt. Miantianshan in a distance. The trail goes down first and up again to Mt. Miantianshan. 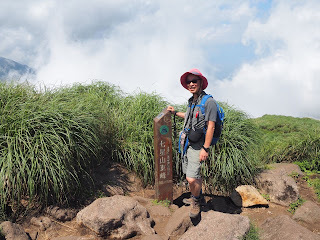 I come to the large flat top of Mt. Miantianshan at 8:40. The thermometer on the sign post shows surprisingly cool 20 degree. There are a few hikers on the viewing platform besides the big antenna and I go up to the top too. The view of Damsui township in early morning light is visible down below and the ocean spreads out beyond. I have completed an ascent to Mt. Miantianshan in one hour and twenty minutes. I keep on the trail down to Miantianping. I come down to a wide dirt trail at 9:02 and turn right to head for Miantianping. A slight uphill trail leads to Miangtianping and a pavilion at the junction comes into view in a few minutes. 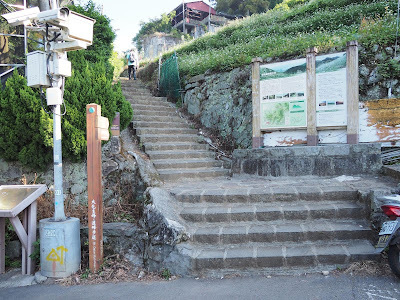 I take left and starts 200-meter ascent to Mt. Dadunshan west peak (大屯山西峰). 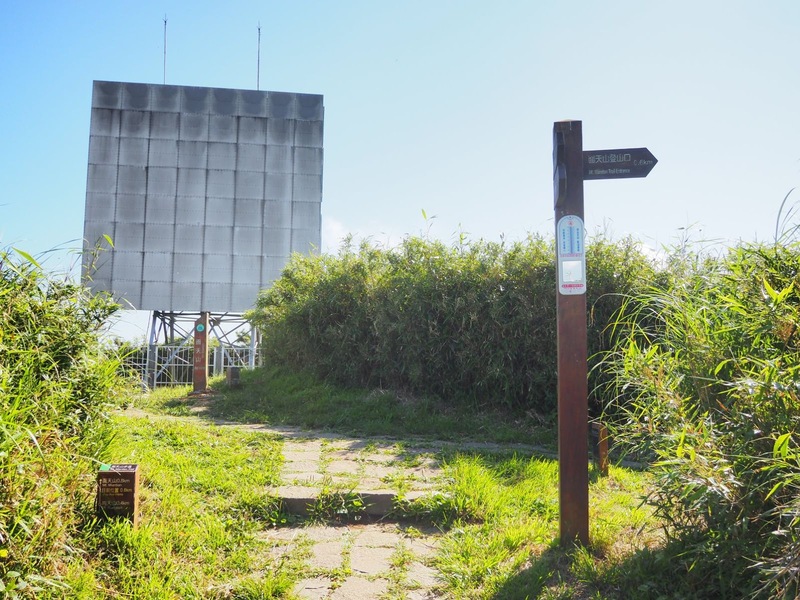 This section between Miantianping and the junction to Mt. 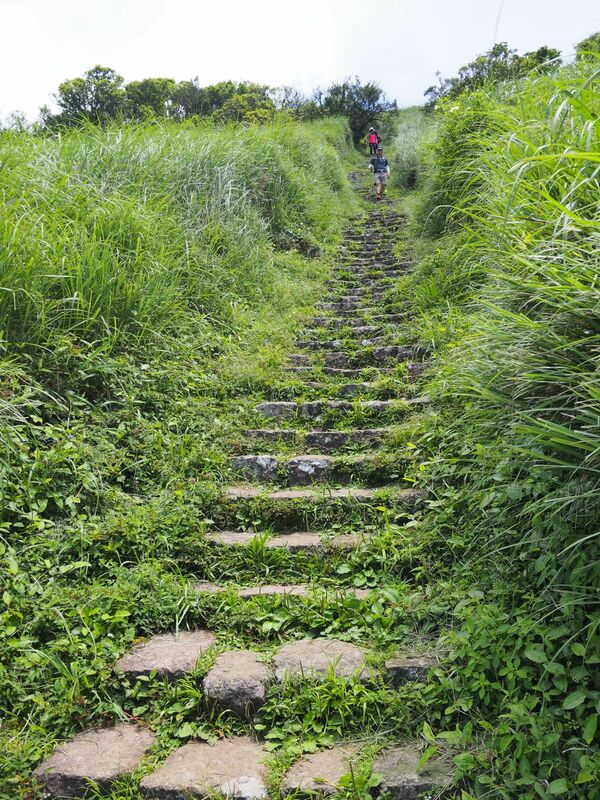 Datunshan main peak (大屯山主峰) is an only dirt trail for today's hike and the rest is all stone paved trials or car road. I come out of woods into a grass section of the trail at 9:28 and keep ascending to the summit. The trail goes between neatly trimmed grasses. In a few minutes I arrive at the top. After a few minutes of rest at the top in a shade of a small tree, I start down the steep descent. In ten minutes I reach a junction. To left the trail goes down to Datunshan trail and to right for Mt. Datun south peak. The flat trail traverses to another junction. At 10:00 I turn left at the junction and start ascent to the top of the south peak. In a matter of a few minutes I reach the summit and keep on the trail down without rest. A gradual descent in open filed gives me a good view of the peaks that I am going to pass over. On my left a massive Mt. 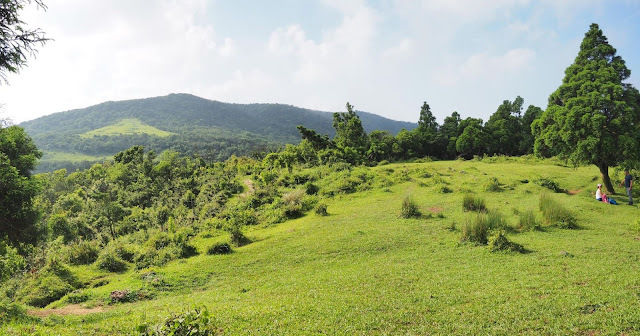 Datun mian peak stands and on my right in a distance stands Mt. 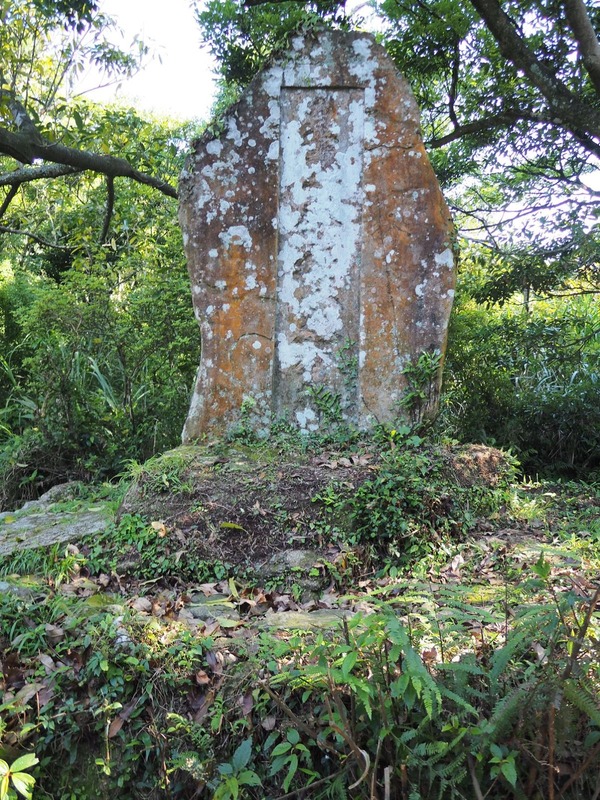 Qixingshan (七星山). 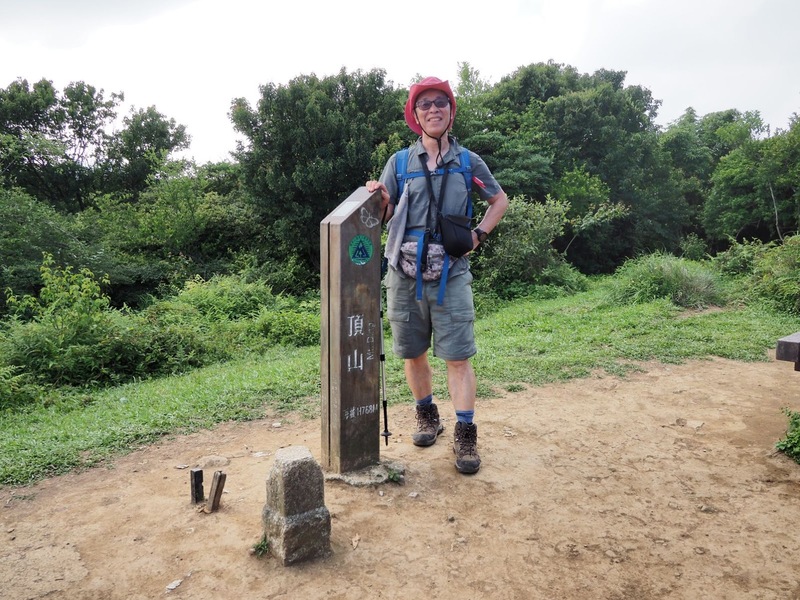 As I go down, the south peak becomes higher on my left and I arrive a junction on Datun trail at 10:17. I have not had a good rest since my start this morning. I take out a sandwich and have bite with a cold drink, which is pretty refreshing. The section from here to the top of Mt. 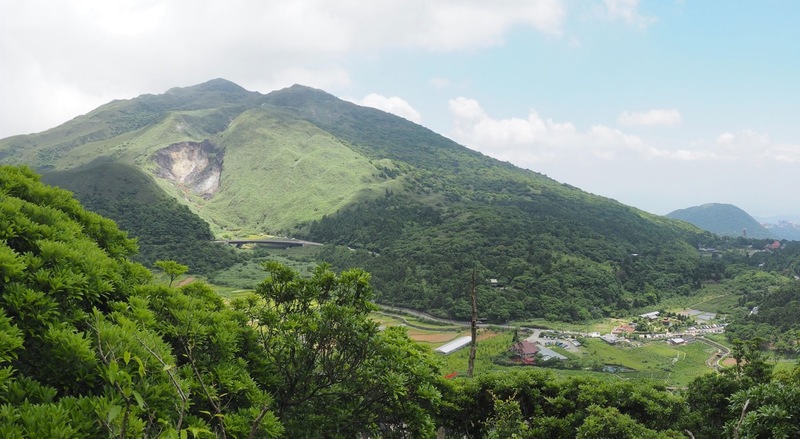 Datun main peak is a steep ascent of 200 meters in elevation. The whole section is almost under sun. To my comfort, breeze sweeps through and it is not unbearabe. A long steep step climb is over when a viewing platform comes in sight at 10:51.It took me about twenty minutes to come up here. A paved road comes to this point from the opposite direction, and a couple of cyclists are resting. The view from the platform covers those peaks that I have just been to, from Mt. Miantian all the way to Mt. Datun south peak. Mt. Guanyinshan is visible far beyond Mt. Datun west peak. I follow the paved wide road and pass by radio communication stations on my right. In five minutes I come to another viewing platform and besides it there is a trail leaving to right. I follow the right trail for another few minutes and a stone paved trail starts in front of a military radio station. It goes on the ridge and soon a grass field spread on your right. Beyond the filed stands Mt. Qixingshan, the next peak, exposing its belly with smoldering sulfur smoke. 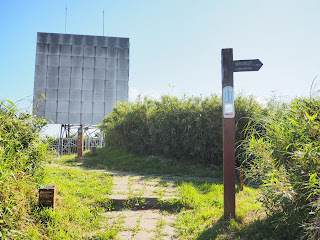 The trail passes the highest point and there is a stone plaque placed in the earth reading 大屯山觀測所, a weather observation station that used to stand here a long time ago. The trail goes straight down to the trail head by Bailaka highway (百拉卡公路) . In front of me sits a massive volume of Mt. Xiaoguanyinshan (小觀音山), which becomes higher as I go down. The long descent ends at 11:33 and I then take right on Bailaka highway. When I walk along the paved road, familiar hikers are coming towards me. 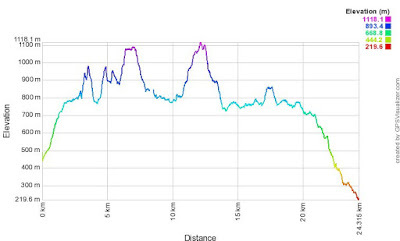 It turns out that they are SK and his wife just doing in the opposite direction of the cross-range hike just like me. They are coming from Fengguizui early this morning and already passed over Mt. Qixingshan. 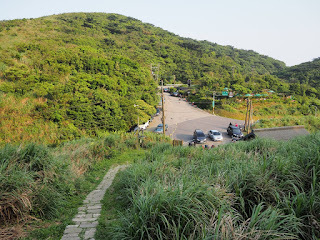 I keep on the Bailaka road all the way to Yangjin highway (陽金公路) and follow it to the trail head to Xiaoyoukeng (小油坑). I walk pass the highest point and go down a little to Xiaoyoukeng parking area. I come to the visitor center at 12:16 and look for a good spot to get myself a break. There are too many visitors and no suitable place, so I go over to the bus stop shelter besides the parking area and have a lunch. After a rather long rest of twenty some minutes, I resume my hike. Many hikers pass by as I go up. This section of the trail must be most popular in the national park. In fifteen minutes I pass by spots emitting sulfur gas and get onto a observation platform. I pass by another spot of sulfur gas and the gradient get very steep. The seemingly endless steep climb ends when I see a viewing platform on my right. From there I follow a moderately ascending trail and the final zigzag climb brings me to the summit of Mt. Qixingshan(elevation 1120m ), the highest point of today's hike, at 13:24. The summit is packed with hikers. A thermometer shows 26 degree. Wind is blowing and it feels comfortable. While I am taking picture a fried hiker, Mr. Y finds me. He says that he also started from Qintiangong temple this morning. He decides to hike with me for the rest of the way. We go down to the lowest point and go up again to Mt. Qixingshan east peak. We then take a long descent to Lengshuikeng (冷水坑). 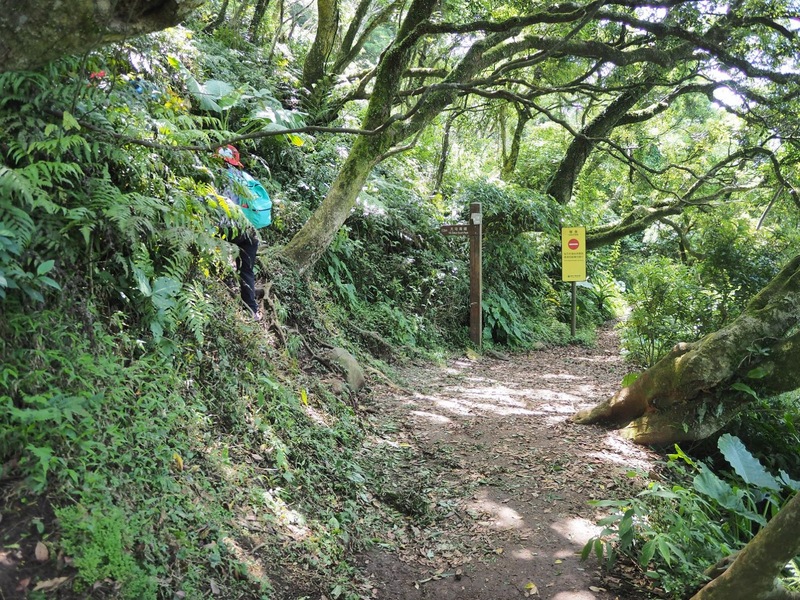 The trail first goes to the edge of a steep slope and it descends zigzag. There are no trees and bushes to obstruct view and a spectacular scenery spreads below your feet. You see countless bumps small and big and green fields woven like a carpet sprinkled with antennas, huts, motor roads and trails here and there. Beyond this big green carpet extends peaks of Mt. Shitiling (石梯嶺) and Mt. Dingshan (頂山), which I am going to hike over in a few hours. Fog is gathering in the valley left to Mt. Shitiling. To the right the metropolitan Taipei is extending south with a silver streak of Dansui river in a further distance. The steep descent ends in ten minutes or so and the trail goes on much lesser gradient. It nears the tall antennas that we just saw from above. We pass by a two-story pavilion and go on another steep steps down to Lengshuikeng. We step on the paved motor road at 14:21 and go over to the visitor center nearby. We take a rest there before the last part of our hike, which is much less of ups and downs but covers a half of the hike distance-wise. 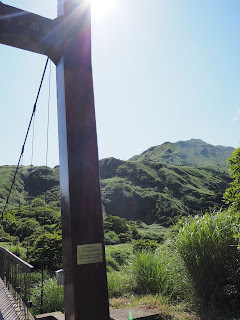 At 14:44 we follow the hiking trail in front of the visitor center and cross a pedestrian suspension bridge. We then take left to go up onto the paved car road, and walk along it all the way to Qingtiangang (擎天崗). There are ups and downs on the car road, but less than a hiking tail parallel to it. It seems that the east-west cross Yanmingshan trek includes a visit to Mt. Zhugaoshan (竹篙山) It would be a detour for us, so we just omit it and follow the Fengguizui trail from Qintiangang. On a such sunny and beautiful day as today, it is pretty natural that a flock of people come up to the hill and stroll on this nice green grass filed. Families and friends are all around the trail and are having great time. Both of us are just hasting on the trail as we still have many miles to cover. We pass by the locked entrance of the trail to Mt. Huangzuishan (磺嘴山) at 15:25. 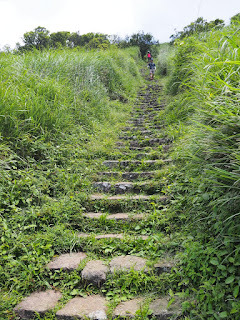 The trail starts ascending and climbs about 100 meters in elevation. We come to the top of Mt. Shitiling at 15:41. The top of this mountain is rather flat and it is hard to tell where the highest point is. We gradually descend to a big open green filed. The trail goes in the middle of the field. Three water buffaloes are bathing in a muddy pond besides the trail. They look at us but don't care. We continue on the trail and come to another green grass field below Mt. Xinglinshan (杏林山) at 15:56. We get onto the field and have a rest. There are a couple of hikers resting under a nearby tree. I have been on stride for 8 hours and a half. There is left three or so kilometers to the end. After a nice rest of fifteen minutes, we resume our hike and hurry south. 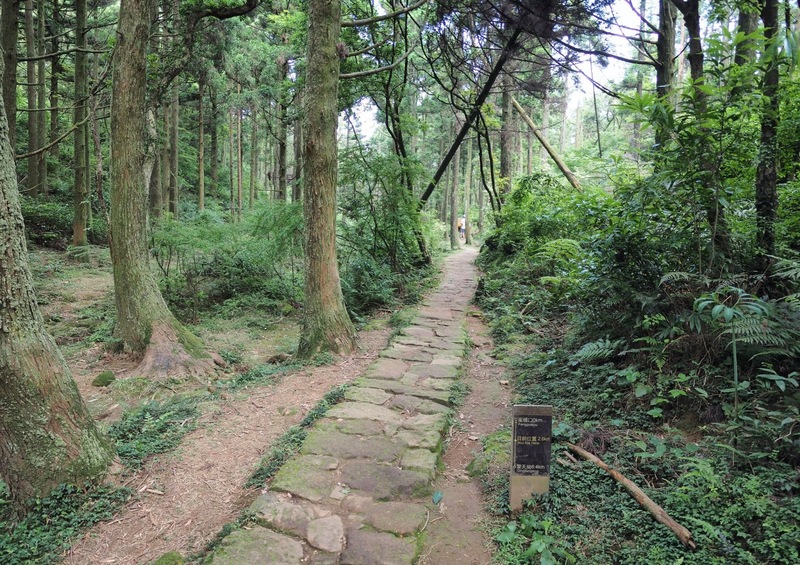 We go into a beautiful forest of ceder trees, which were originally planted during the Japanese era. We go up a little and get out of the ceder woods. We come to the last summit on the trek, Mt. Dingshan at 16:29. The trail descends and goes by the west side of the ridge line. The sun light shows yellowish color and tells us the sunset is not far away. We make it to Fengguizui at 17:00, marking about 9 and a half hour as my elapsed time of the cross hike. 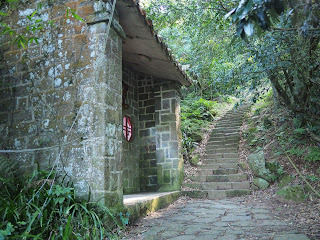 The east-west cross hike is over, but we need to go down to a bus stop near Shenrenqiao (聖人橋) for returning to the city. We go down via stone paved trails and car road, which is another three kilometers. We arrive at the bus stop just to catch a 18:00 S18 bus(小18公車) to MRT Jiantan station (劍潭站). I covered 24.3 kilometers including the last section from Fengguizui to the Shenrenqiao bus station. 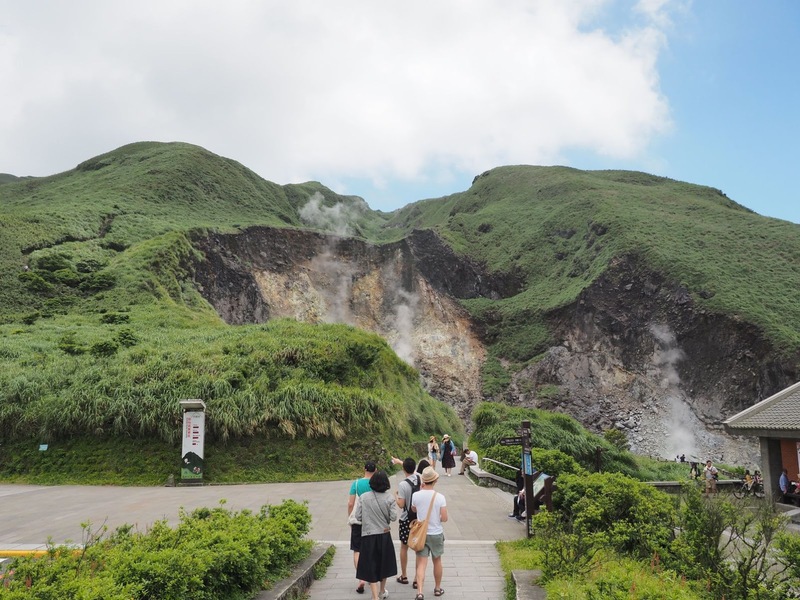 The total ascent is approximately 1,800 meters and descent, 2,030 meters. Including rest, it took me 10 hours and a half, which must be a little better than the average. 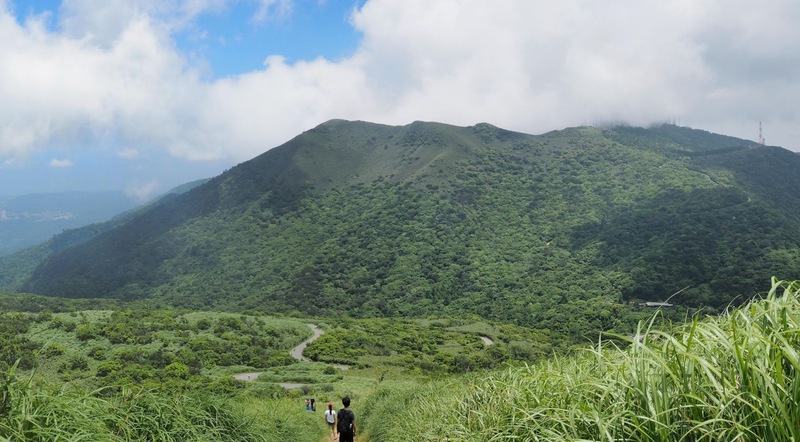 This strenuous hiking is not a fun in itself, as you just keep walking and have little time to rest and enjoy views, but can leave you a sense of accomplishment and confidence, which may be useful for other hiking activities on other days. テーマ画像の作成者: Nikada さん. Powered by Blogger.